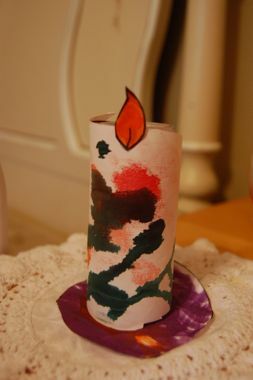 This afternoon, we made a paper candle with construction paper and a toilet paper roll (modify this template). 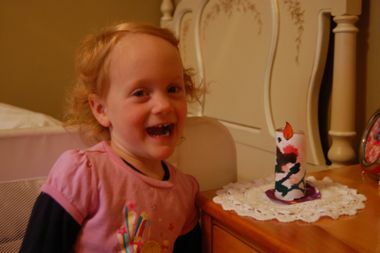 We set it by Vivienne’s bed so that she can remember the verses when she wakes up and when she goes to sleep. Yesterday, when we compared a lit and an unlit candle, we went one step further and covered the lit candle with a metal bowl. The light disappeared; the candle went out. A light cannot and should not be hidden. We might repeat that powerful visual lesson and talk about some of things that might try to hide our light. When we hang her candle by her bed, we’ll pray for each other to be lights that glorify God. Over the weekend, we’ll keep talking about the verses and looking for ways to do good works that glorify God. Check back in on Monday for more lesson ideas! In the meantime, let your light shine!